Classic Mojitos. 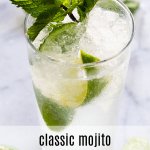 Enjoy the refreshing taste of mint and lime in this easy to make mojito recipe! This mojito recipe makes the perfect drink for summer, or winter! 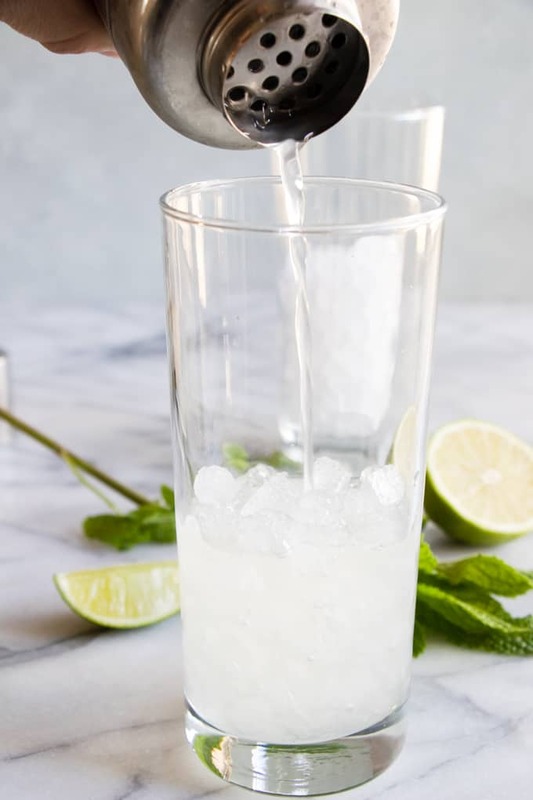 I love the refreshing hint of lime, but even more I love the flavor of the fresh mint in this drink. These are the perfect sit back and relax sipping cocktail recipe. A mojito is a classic Cuban cocktail. 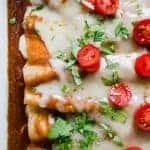 It has a sweet, citrus flavor that comes from using fresh lime juice and sugar. 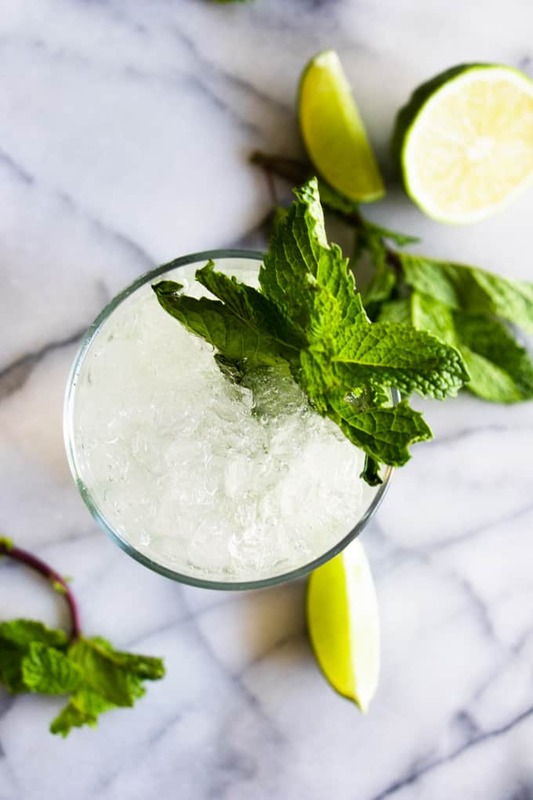 Mixed with fresh mint leaves and white rum, this classic mojito recipe is perfect for sipping on a hot day, or for celebrating any time of year! 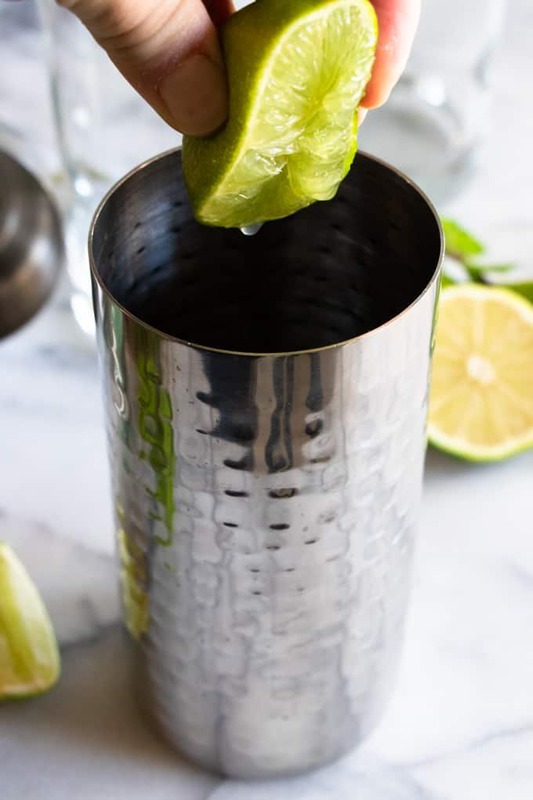 Mojitos are easy to make in a cocktail shaker. This allows you to muddle the mint leaves, and not end up with a drink that you need to strain with your teeth while you drink it. Not to mention you don’t need to floss all the green out the moment you are done. Add about 8-10 mint leaves to your cocktail shaker. Squeeze half a lime. And muddle these together. You only want to muddle the mint leaves enough to bruise the leaves, you don’t want to break them up into small pieces. Add the ice which will help chill the drink. Pour in the simple syrup and rum. Give it a shake. Pour the drink over some ice in a highball glass and top with club soda for some fizz. Simple syrup is an easy way to add sweetness to a drink. 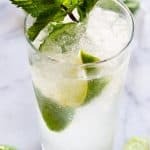 I love using simple syrup in this mojito recipe because it’s easy to mix in with the sugar already dissolved in the syrup, leaving no grittiness in the actual cocktail. To make the simple syrup, take equal parts water and white sugar. Heat the water in a small saucepan while stirring, until the sugar completely dissolves. This can be stored in a sealed container in the refrigerator for about 1 month. 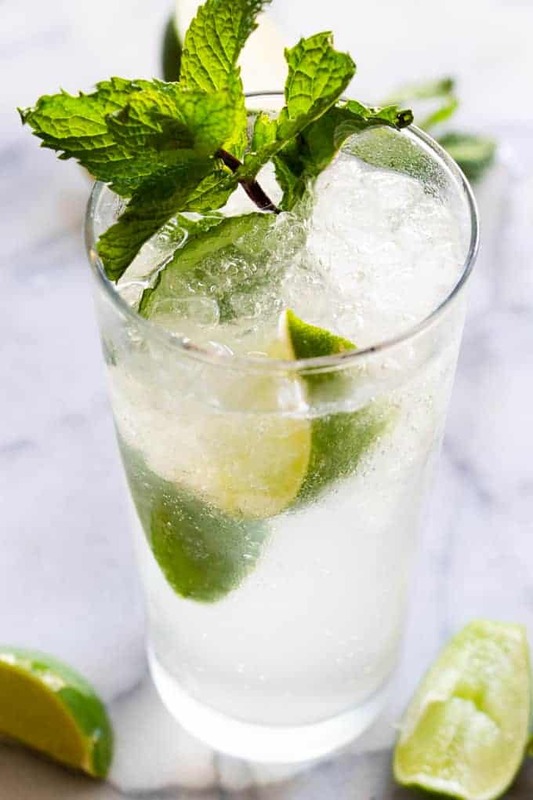 If you would prefer another method instead of using a simple syrup in a mojito you could use a small amount of sugar instead, add about 2 tablespoons sugar with the mint leaves and lime juice, muddle it all together. Then add the ice and rum to the shaker. 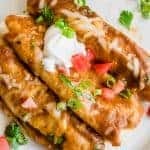 You can also use agave syrup, it doesn’t have much flavor to it like honey would, which makes it a better option for adding to drinks as a sweetener. 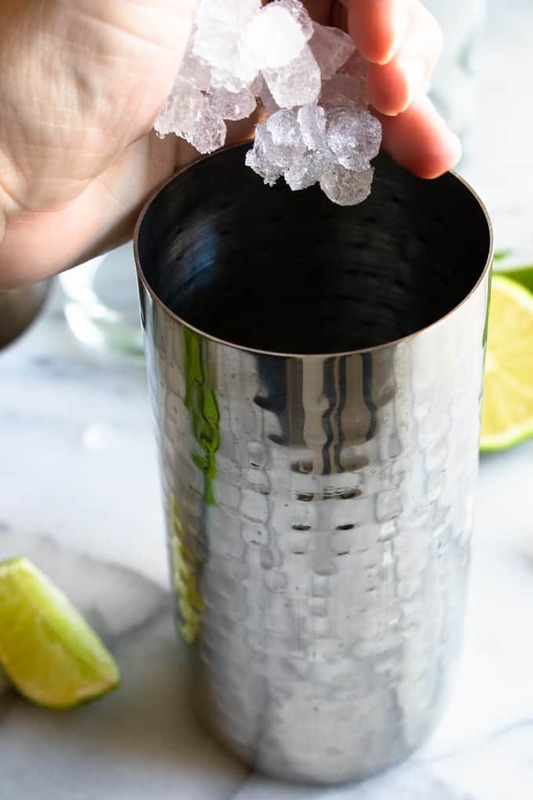 Cocktail shaker (affiliate link)- an easy way to mix drinks, add some ice to help chill the drink also before serving. Muddler (affiliate link)-this allows you to squeeze the juice and flavors from the ingredients being added to the drinks. Glasses (affiliate link)- You definitely need something to drink from! These highball glasses are perfect! 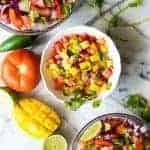 WANT TO TRY THIS MOJITO RECIPE? 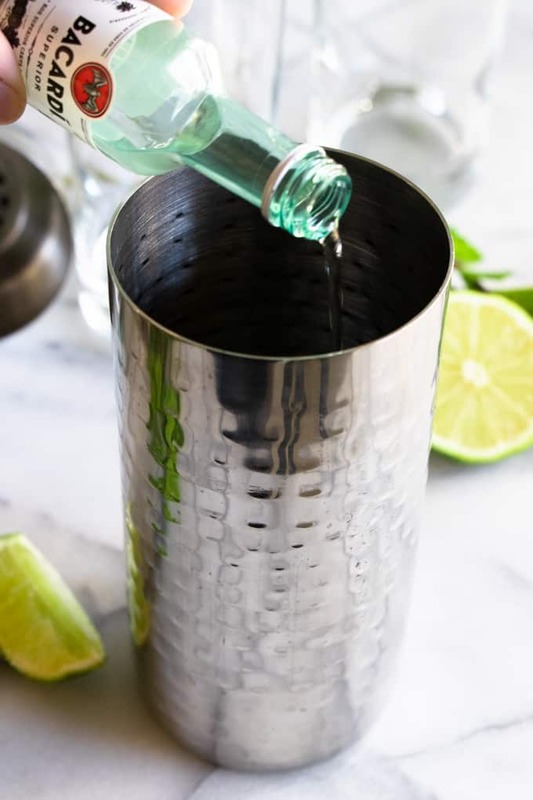 Add the 8-10 mint leaves to your cocktail shaker. Squeeze in the juice from half a lime. Muddle these together. You only want to muddle the mint leaves enough to bruise the leaves, you don’t want to break them up into small pieces. Add some ice to the shaker. Pour the drink over some ice in a highball glass and top with club soda. 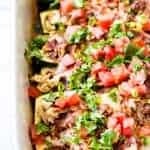 Garnish with additional mint leaves and lime wedges. To make a simple syrup heat up 1 cup of water with 1 cup of sugar. Stir until the sugar is dissolved. 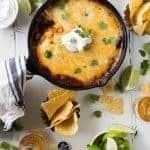 Can heat water in the microwave to boiling and stir in the sugar, or you can heat the water on the stovetop with the sugar and stir until sugar completely dissolves.